Note: Chard can be harvested while the leaves are young and tender, or after maturity, when they are larger and have slightly tougher stems. Chard has shiny green ribbed leaves, with stems that range from white to yellow to red, depending on the cultivar. Other notes: It has a slightly bitter taste. 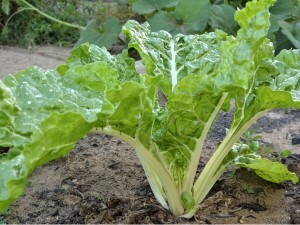 Chard is a beet that has been chosen for leaf production at the expense of storage root formation. 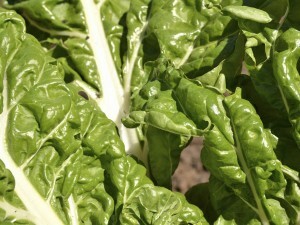 Chard packs a huge amount of vitamin A and it is naturally high in sodium. One cup contains 313 mg of sodium, which is very high for vegetables. Chard is also surprisingly high in other minerals as well, i.e., calcium, iron, magnesium, phosphorus and potassium. Swiss chard is not only one of the most popular vegetables along the Mediterranean but it is one of the most nutritious vegetables around and ranks second only to spinach following our analysis of the total nutrient-richness of the World’s Healthiest vegetables. It is also one of only three vegetables that we recommend boiling to help reduce its concentration of oxalic acid.